Pesky Flying Insects That Bug Floridians and Visitors Alike! Do you know what mosquitoes call the dance that most humans do? The "Smackerena." These pesky bloodsuckers that leave you scratching are more than just a nuisance... they are a menace. They can carry diseases – Zika, encephalitis, malaria, West Nile Virus – and can cause heartworms in your canine friends. Chemical sensors that can sense carbon dioxide and lactic acid up to 100 feet away. Just about any mammal or bird gives off these gases as part of its normal breathing. Certain chemicals in sweat also seem to attract mosquitoes. 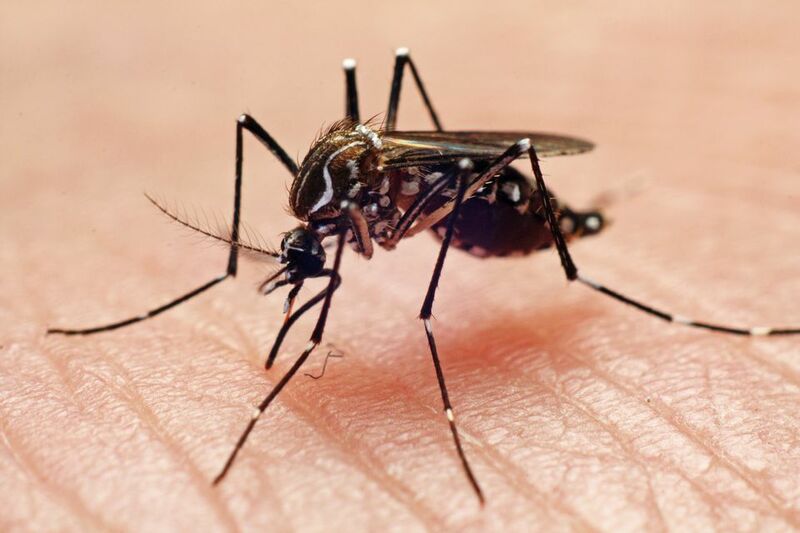 Mosquitoes can detect heat, so warm-blooded mammals and birds are easily found once they get close enough. Mosquitoes have visual sensors that can easily see contrasts and movement. Use a mosquito repellent. Sprays or lotions containing DEET (NN-diethyl-meta-toluamide) at a concentration of 7.5 percent to 100 percent is suggested and a 15-percent concentration is recommended for children. For a DEET-free alternative, try lemon eucalyptus, citronella oil, lemongrass, or rosemary. Permethrin is an effective pesticide that can be sprayed on clothing only and will help repel mosquitoes. Never apply Permethrin your skin as it is a neurotoxin. Stay inside! Avoid times of the day (early morning, dusk, and evening) that mosquitoes are most active. Help control the mosquito population by eliminating sources of standing water where they may breed. Plecia nearctica, commonly known as the "love bug," is really not a "bug" at all – it is a fly (Diptera). But, whatever it is, it's known to bother drivers on Florida's highways as they emerge in April and May and again in September and October. The "love bug" nickname seems to have evolved by the visible in-flight mating of the species. Females emerge from their larvae into a swarm of males and are grasped by a darting male. The pair falls to the ground where they couple and eventually take flight – often into the path of your speeding vehicle. "Love bugs" are drawn to the highways by light and automobile exhaust fumes. If you are traveling mid-morning or mid-to-late-afternoon, you are more likely to have the hood and windshield of your automobile pelted with the winged black "bugs" which leave behind hard-to-remove carcasses. Other than avoiding the peak hours for the "bugs" flight, not much can be done to spare your automobile. Regular windshield wiper fluid often does not easily remove the bugs and the result of running your wipers is a streaked gooey mess that cuts visibility. Keeping a bucket in your car stocked with a bottle of water, a non-scratch pad, and baking soda is your best defense. The baking soda is known to make removal of the little critters easier. Fabric softener sheets will also work in removing these pesky pests from your windshield. Also known as "sand fleas," noseeums can make a morning or late afternoon at the beach unbearable – especially in the summer and early fall. They are nearly invisible and their bite or sting really isn't a bite or sting – it is the sensation you feel when the acid in their bodily fluid hits the skin. Sand fleas are actually a gnat (Culicoides furens) that are sensitive to temperature and humidity. Some swear by and application of Avon's Skin So Soft to keep the little critters away, but any insect repellant with DEET is sure to do the trick. Just remember that you may need to reapply after going in the water.